Falvey Memorial Library :: Enjoy trial access to a unique collection of American Indian Newspapers! 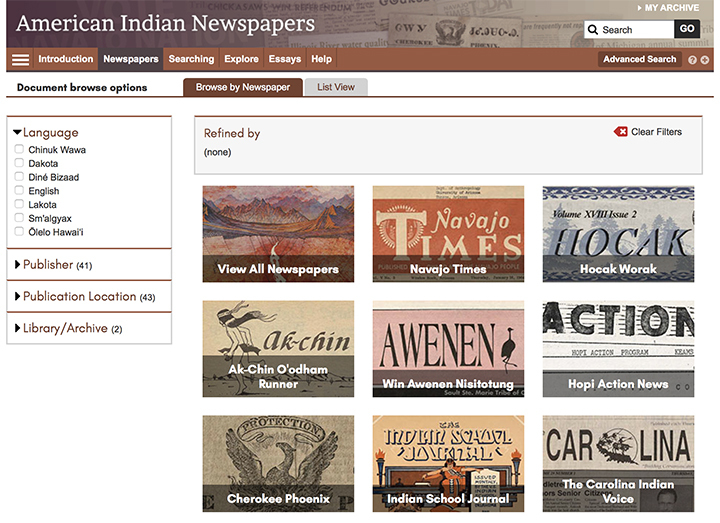 Enjoy trial access to a unique collection of American Indian Newspapers! This one-of-a-kind collection brings together newspaper archives from the Sequoyah National Research Center (University of Arkansas at Little Rock) and the Newberry Library in Chicago. It covers nearly two hundred years of American Indian history in North America from 1828 to 2016 and offers American Indian perspectives on federal and tribal politics, self-representation, environmental activism, the American Indian Movement, tribal schools and colleges, local news coverage, and many other topics. In addition to the archival newspaper content, the collection features essays contributed by a group of highly-regarded scholars. Villanova’s own Paul Rosier authored the essay on “Political Activism in American Indian Newspapers.” He also served on the editorial board. The Villanova community has access to similar content through Ethnic NewsWatch although that source has much narrower spatial and temporal boundaries and does not include surrogates of the historical documents. The trial ends on November 1, 2018. Document downloads will not be available during the trial period. Contact Jutta Seibert (jutta.seibert@villanova.edu) if you would like to recommend this database for purchase.